Perfectly sized to fit under a loft or to set in the corner of a room, this desk is a simple and tasteful addition to a youth room or cabin. The two drawer are excellent for holding schoolwork, papers, and books, and it has a lower open compartment for any miscellaneous items. 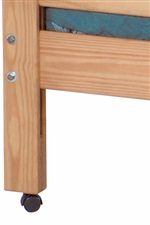 It is constructed from pine and given a durable oil finish that give the style a hand-crafted look and feel. The Pine Bedroom Casual 2-Drawer Desk by Crate Designs at Jordan's Home Furnishings in the New Minas, Halifax, and Canning, Nova Scotia area. Product availability may vary. Contact us for the most current availability on this product. Handles & Hardware Carved out handles instead of hardware. Case Detail Legs and edges coordinate with the hand-crafted style. 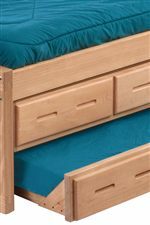 With a simple style, this pine bedroom collection makes an excellent addition to a youth bedroom, guest room, or cabin. 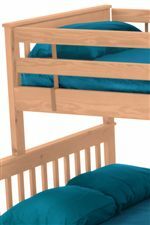 Bed options vary between simple twin beds, bunk beds, and loft beds, all designed with simplicity and functionality in mind. The beds can be arranged and paired with other items throughout the collection to create space-saving sets, and under bed trundles and drawers are available for efficient storage. 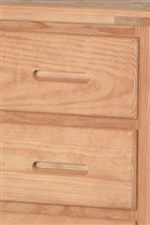 This collections is constructed from pine solids and veneers and has a simple oil finish that brings out the pine's beauty. The hand-crafted look and feel complete the casual style of this collection. The Pine Bedroom collection is a great option if you are looking for Casual furniture in the New Minas, Halifax, and Canning, Nova Scotia area. Browse other items in the Pine Bedroom collection from Jordan's Home Furnishings in the New Minas, Halifax, and Canning, Nova Scotia area.